While working into the wee hours of the morning revising a manuscript or casting the arcane runes that will become next year’s budget, every palaeontologist has the appropriate music running in the background. 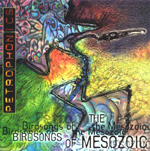 Birdsongs of the Mesozoic produce the right combination of fiery energy wrapped up in icy melodies that keep one’s mind focused while letting the imagination soar. Their latest disc "2001 Live Birds"is a fine addition to the palaeoblog’s ever shifting musical tableau and we recommend that you go to NearFest Records and pick up a copy for yourself.